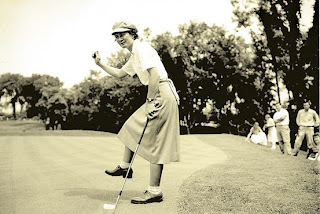 One of golf's most talented players of all time, Mae Louise Suggs, was born in 1923 in Atlanta, Georgia. Her father was a professional baseball player who later ran a golf course. Louise began playing at age ten and quickly developed into a highly successful amateur player. She was a founding member of the LPGA Tour, and had a bitter rivalry with Babe Zaharias whom she felt was a bully. Suggs demolished the field in the 1949 US Open, winning by a record 14 strokes ahead of the second place Zaharias. After a tournament in 1953 that Zaharias won, Suggs refused to sign Babe's scorecard. During their round, Suggs felt that Babe had "stretched the rules" in getting a favorable ruling. Suggs was known for a powerful and athletic swing which prompted Bob Hope to nickname her "Louise Sluggs". She won 58 tour events, and 11 majors. She also won both the U.S. Women's Amateur and British Women's Amateur. She was enshrined in the World Golf Hall of Fame in 1951, yet at the very height of her career, she stubbornly stopped playing the full Tour schedule. It was after being insulted when she was fined $25 for withdrawing from a tournament for which she had signed up. "TEED OFF" Good for Her! 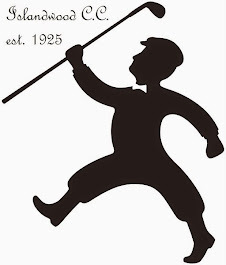 Copyright High Draw Partners Inc. - Islandwood Country Club 2017. Picture Window theme. Powered by Blogger.